These all American classics are so good with a glass of cold milk. If you put oats in something it makes it healthy. That’s not a question, it’s a statement. It’s not necessarily true but I would like it to be. 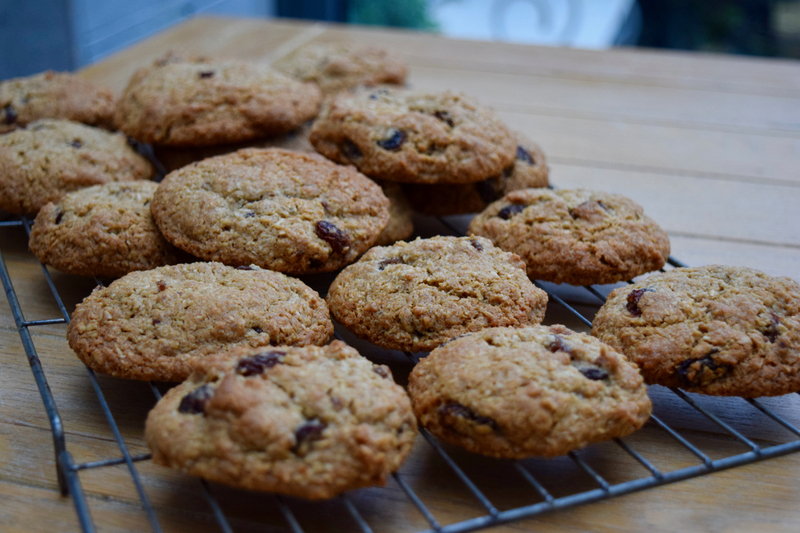 Let’s face it, these soft, maple flavoured cookies are effectively porridge in handheld form. Again, not the whole truth, but there are worse things you could be eating. 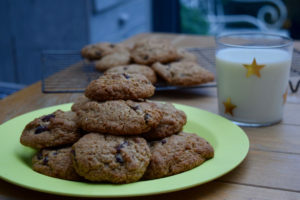 I love a cookie and have been making these Oatmeal Raisin Cookies since the boys were small, and believe me when I say, as they are both over 6ft, that is a long, long time ago. 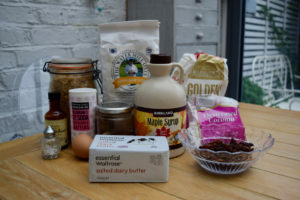 I have tried them with dried cranberries and white chocolate, but today, I have reverted to the classic recipe in honour of our American friends and their Thanksgiving celebrations this week. This recipe originates from the Doyenne of baking Ms Martha Stewart from her Baking Handbook, which is a well thumbed classic on my bookshelf. 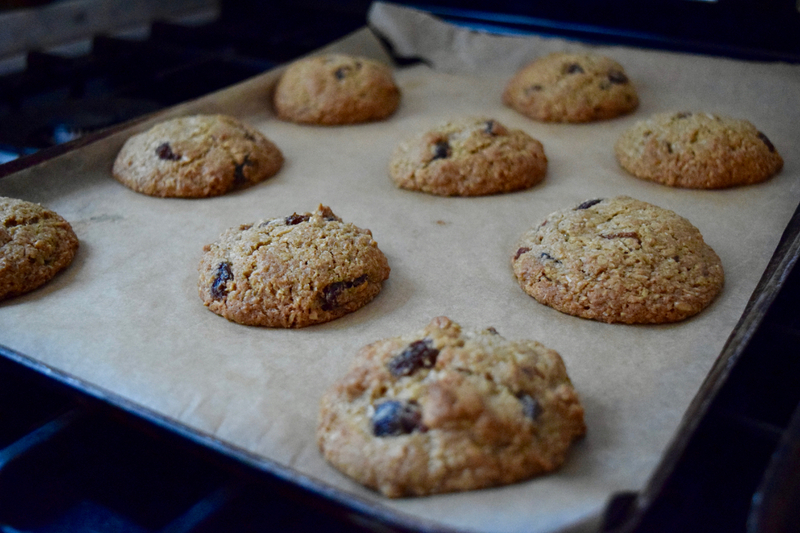 There is no better person to turn to when baking an American favourite such as an Oatmeal Raisin Cookie. This is a cinnamon maple flavoured treat, it’s soft but with crisp edges. 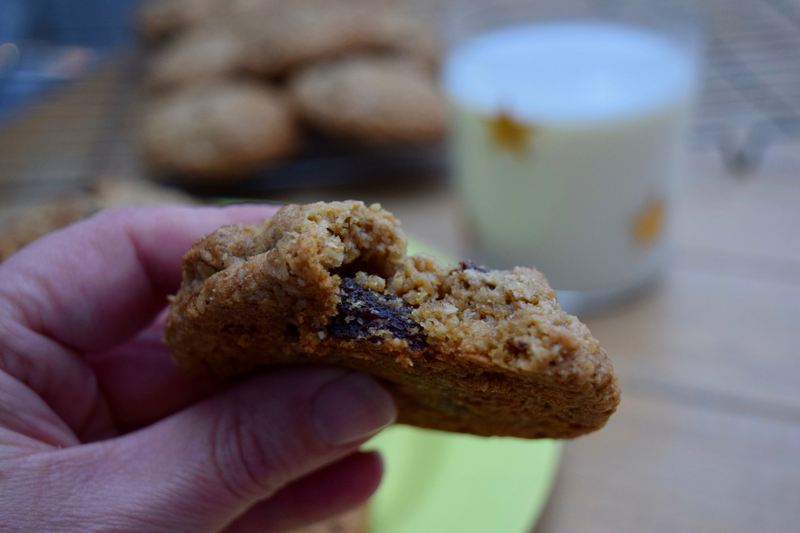 The cookies are packed with raisins, oats and coconut for added texture. A tip from one of the chefs at work is to soak your raisins first in some boiling water to plump them up and it’s a goodie. 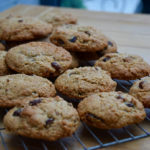 The add some chewy and fruity interest to these delicious biccies. 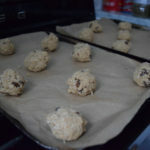 I also love these biscuits because they are quick and easy to make; there’s no need to chill the dough, just fashion into balls and pop in the oven. 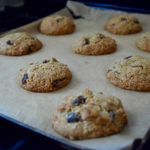 It makes a hoofing great big batch too, so you’ll have cookies for days, or enough to pop in the freezer for treats another day. 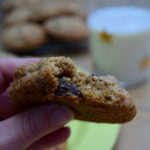 These Oatmeal Raisin Cookies make a great jar filler and will bring forth thankfulness from all who cross their path. This post will feature on Lucy Loves later this week. Pre heat your oven to 170 degrees and line two large baking sheets with baking paper. 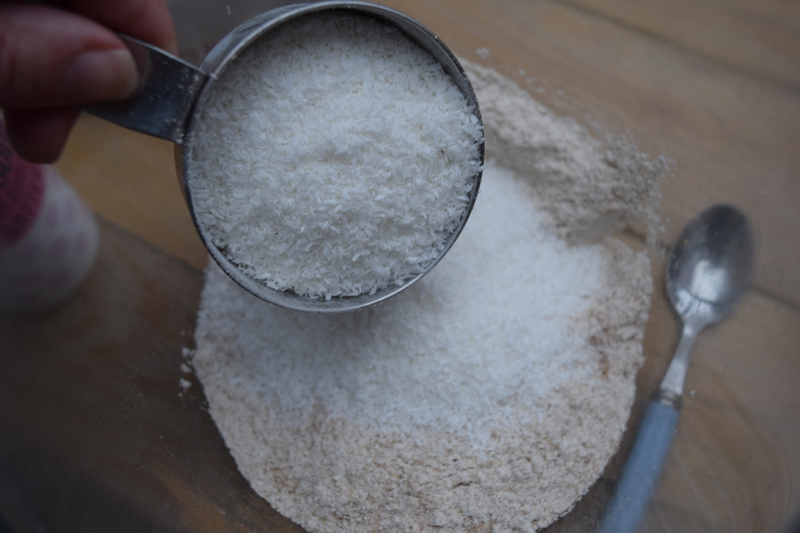 Weigh out your flour, cinnamon, bicarb, salt and desiccated coconut into a bowl and pop to one side. 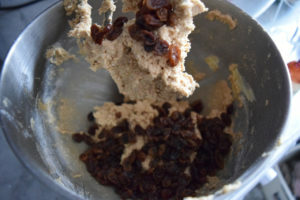 Take your raisins and pour over boiling water to plump up a little while you make a start on the biscuit dough. 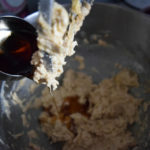 In your stand mixer or bowl beat your soft butter and brown sugar until light and fluffy. 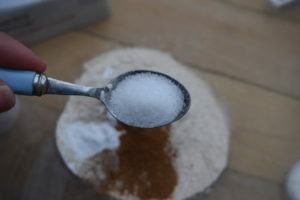 Add the maple syrup, scraping down the sides of your bowl or mixer then add the egg and vanilla and beat well. 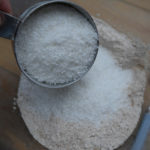 Beat in the flour in two batches until combined then mix in the oats and the well drained raisins. 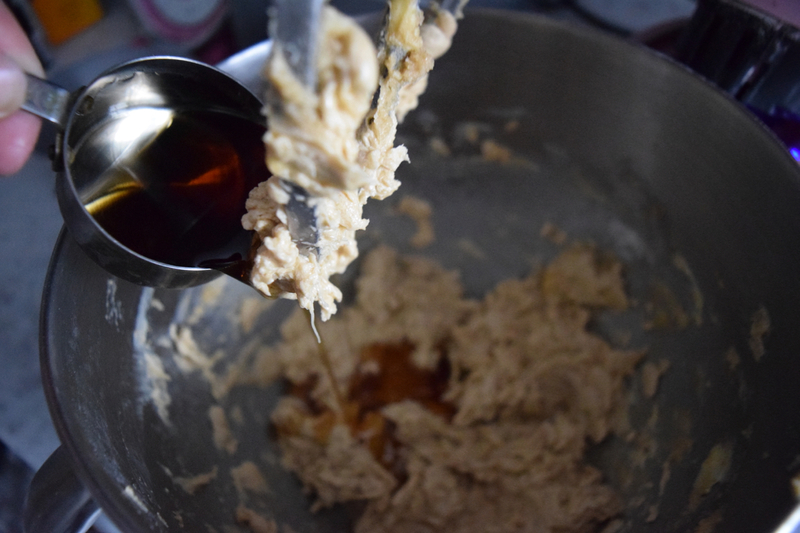 Beat gently until the dough is well mixed. 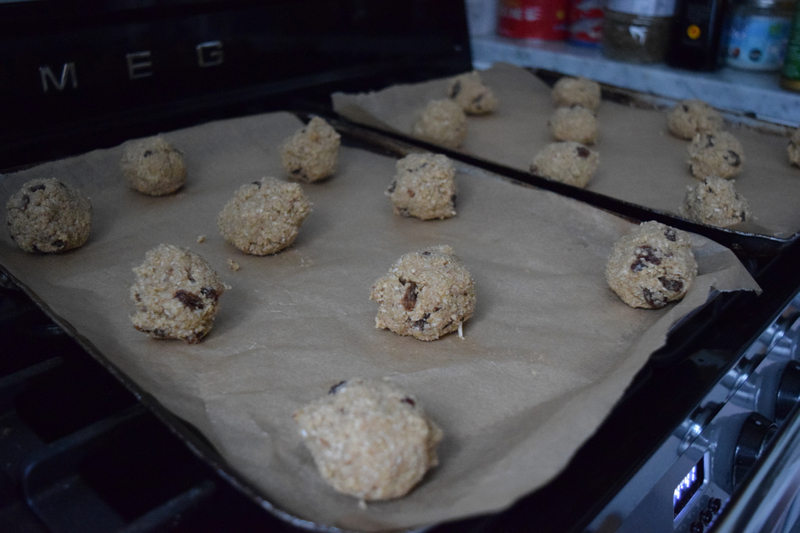 Spoon two tablespoon sized balls onto your lined baking sheets and press down slightly. Leave plenty of space between each ball to allow them to spread. You may need to cook in two batches if your baking sheets are full or freeze any spare dough for another time. Bake the cookies for 15 to 20 minutes or until golden but still soft in the middle. Allow to cool slightly before placing on a wire rack to cool completely. Devour. These will keep in an airtight tin for up to 3 to 4 days or the dough freezes well, uncooked, for around a month.